Australian Box Jellyfish. You may have heard somewhere that jellyfish are dangerous. That’s true but none are as dangerous as the Australian Box Jellyfish. Also called a Sea Wasp, this jellyfish is frightening in appearance when you finally see it but it’s tough to see since it’s almost completely transparent. When you do see them, you might think that you’re looking at a mutant of some kind since they have multiple eyeballs on their stomachs. Creepy! They tend to be cube-shaped instead of dome-shaped so if you see something like that in the water then you might want to get away! 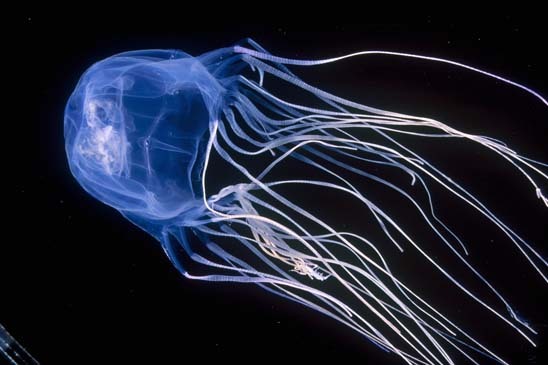 This entry was posted in 5% acetic acid/Vinegar on jelly stings, Box jellyfish, florida-jellyfish-portuguese-man-of-war-florida-beaches-long-island-beaches-hawaii-waikki-oahu-guam-austalia-stingersmauve-jellyfis-pelagia-nortiluca-black-sea-nettles-stingrays-sport-fi, jellyfish, jellyfish sting first aid, Jellyfish sting remedy, jellyfish stings, Jellyfish stings, vinegar, acetic acid, Lion's mane jellyfish, Man of War, marine sting first aids, marine stings, Pacifici coast sea nettles, Pelagia Nortiluca, sea nettles, StingMate, Uncategorized, Vinegar on Jellyfish stings. Bookmark the permalink.